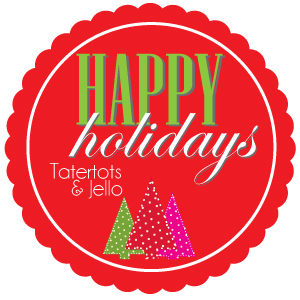 Hello Tatertots and Jello readers! I’m Chris from Just a Girl, and Happy Holidays to you! Well, they’re happy as long as you have all your shopping done, right? This time of year can be ultra-busy for the holiday gift-giver, so I’m here to show you an easy and inexpensive gift to give–especially if it’s last minute! 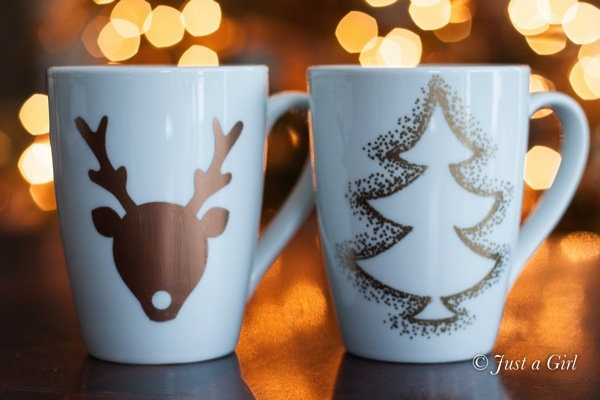 DIY Christmas Mugs! Let’s talk about easy directions first, shall we? Buy some mugs at the dollar store. Wipe the mugs down with rubbing alcohol (I don’t know why–just do it), and either use a craft cutter or some shaped stickers to place on the mug. Let me clarify–I have no artistic skill whatsoever. I can barely trace better than a second grader. If you have mad skills, congratulations to you. You’re way cooler than me. If you don’t, this is the way to go! Once the sticker is applied, just stipple (cool word) your marker all around the shape. The first row should be very tight to create the outline of the tree. Then just start spreading out the dots as if they are dissipating until you like the way it looks. Once you’re done, just take the sticker off. Ta da! The reindeer mug is just the exterior of the sticker. I lined it up as best I could and colored it in. And that, folks, is all she wrote! Well, not really. Place the mugs in the oven for about 20-30 minutes at 350 degrees. I HIGHLY recommend using the oil-based Sharpie markers. I used what I had on hand, so these won’t hold up beautifully in the wash. They’ll be fine for hand washing, but if you want them to stay, use the oil-based. For a little touch of pizzaz, I placed a little sapling into each mug–festive, no?–and considered it done. Cost? $2.00. I guess it would be a bit more if you didn’t have the other supplies, but I only needed the mugs. I love being a part of anything Jen does, so I’m pretty darn happy to be here! Thank you for reading along! Happy Holidays! 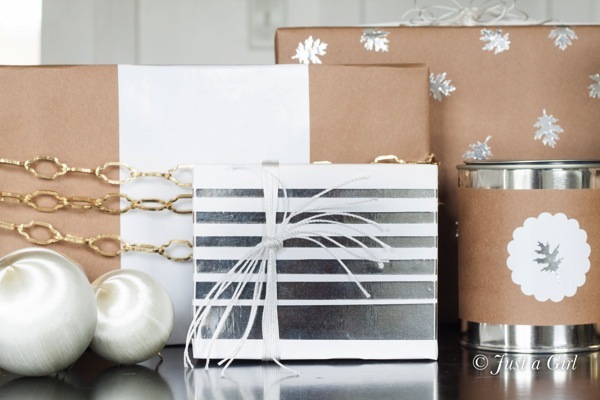 I just loved her ideas for Masculine Gift Wrapping for the man in your life! 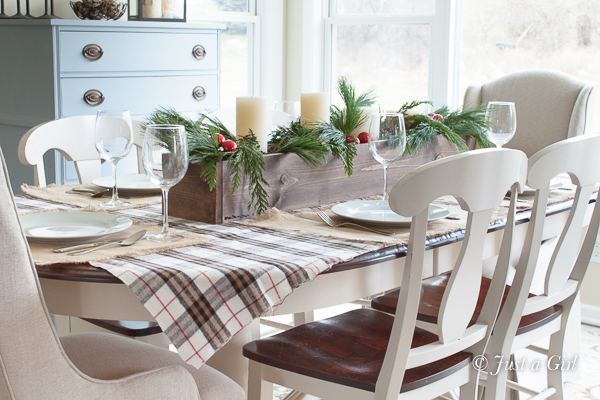 And, this DIY Christmas Centerpiece idea is so timeless and pretty! 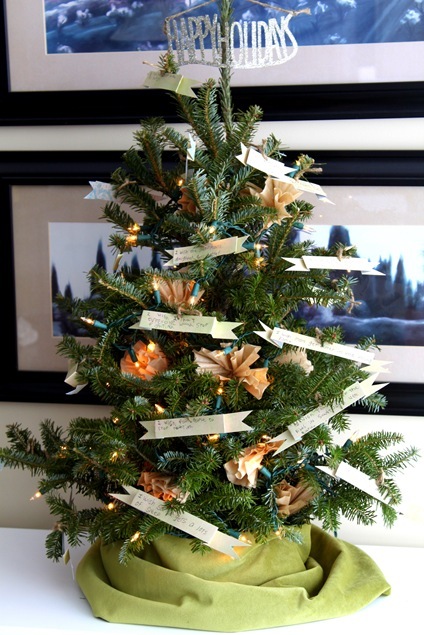 And, I still love this idea she shared a couple of years ago of a Wishmas Tree. It’s a great way to teach older children to think about others during the holiday season! Love this idea! Just wondering if the temp is in C or F? I made these mugs and followed the instructions exactly and all the ink came off. Any ideas about what went wrong.? These are really so adorable! Love this idea. Oh Chris I love these!! I’ve seen loads of handmade sharpie mugs over on pinterest, but these are my favourites by far!!! I just adore the reindeer one!! Wow I love these! I am all about gold and polka dots lately. Cute idea! I love this idea! I’m all finished, though…I guess I’ll have to stock pile this away for next year. Thank you so much, Emily! They were fun to make! Megan, I used shapes from my Silhouette and cut them out. I just measured the mug and made sure the sticker was a bit shorter than it. Hope that helps!